My name is Laure-Anne and I help with dog behaviour problems around The Hague (Canis bonus). I am also Head Trainer at OhMyDog! (dog training school in The Hague). I graduated in Zoology, and am a certified dog trainer and applied animal behaviourist. If you are worried or annoyed about your dog’s behaviour and live in The Hague, tell me about the problem on this page. It can be for minor things like jumping on guests or more serious issues like aggression. I’ll come meet you and the dog and explain what happened and how to solve it. Together we’ll choose the approach that you like best. I work in The Hague, Delft, Rijswijk, Wassenaar, Westland and region. Do you want to read more about how it works first? I explain in all here. Do you just want regular, reliable information about dog behaviour? You can read my latest dog book reviews and follow my blog. That’s where I keep my finger on the latest findings in animal behaviour and training, and share the progress of my clients with you. 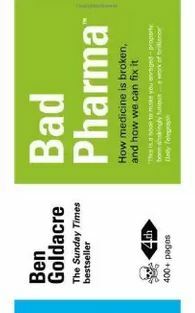 Another scathing book by Ben Goldacre. This time, he points his sci-skept [did I just invent a new word there?] finger at the dodgy practices of the pharmaceutical industry: from brushing adverse effects under the carpet to exaggerating therapeutic benefits or bribing GP’s. A shocking and disheartening look at the mess that is the pharmaceutical industry. You will be outraged, but at least you will be informed. Why is this relevant to dog behaviour? Because psychopharmacology is increasingly used as an adjuvant to behavioural therapies for dogs with severe behaviour problems. Behaviourists owe it to their patients to be minimally informed on the issues surrounding this controversial topic. If I’ve whet your appetite, check the full review here. This entry was posted in Dog writing. Bookmark the permalink. Post a comment or leave a trackback: Trackback URL.